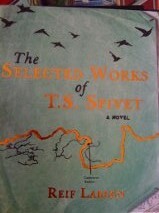 The Selected Works of T.S. Spivet by Reif Larsen is one of the most unusually laid out books I’ve ever read. The story itself is also very unusual. The story is told by 12 year old TS, who lives with his parents and sister on their ranch, high up in the mountains in Montana. TS’s father is a laconic rancher who TS has little in common with and his mother, who TS calls Dr Clair, is a scientist who has spent the last 20 years searching for a beetle which is either extinct or mythical. TS’s brother, Layton, died the previous year when he accidently shot himself while assisting TS with an experiment. The book itself is an unusual size for a novel, maybe five centimetres wider than normal hardback books. The extra space is used for pictures of TS’s work and side tracks to the telling of the story. 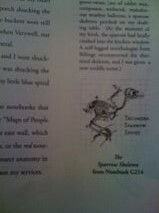 The illustration below is TS’s picture of the skeleton of the sparrow he was named for. TS, although only 12, is a mapmaker. He charts absolutely everything that moves and plenty of things that don’t. The pictures down the sides of the text relate to the part of the story TS is telling, and usually have an explanation also. The illustration below serves to show the difference in the way TS and his brother Layton’s brains work, in that Layton coloured in his First Thanksgiving with the Pilgrims colouring book and TS used his to make measurements. TS’s mentor, Dr Yorn, has been forwarding TS’s work to the Smithsonian Institute for years. The story begins with a phone call telling TS he has won a major award from the Smithsonian for the advancement of science, which includes a year-long placement. The caller doesn’t realise TS is a child when he invites him to the award ceremony the following Thursday. Instead of telling his parents or even Dr Yorn what is going on, TS hops on a freight train and travels across the country to attend the ceremony. After a great many adventures, mapping, stories and sidelines, TS arrives, not quite intact. Once in Washington DC, TS has to navigate an adult world where a great many demands are made of him. At first I was annoyed by the pictures and notes in the margins, but once I slowed down and relaxed into the book, I started looking forward to the markers in the text telling me I was up to the next illustration and explanations. They were very interesting sidelines which sometimes filled in backstory or helped the story to move forward. Sometimes though, the sidelines didn’t go anywhere, except to give the reader an idea of how completely random the thoughts in other people’s heads must be. TS’s character was lovely too. He was terribly serious, sometimes child-like and sometimes not, but he was always charming. His family had been fractured by Layton’s death, which was never spoken of, and there were other issues and mysteries that TS learned more about and understood more of as he travelled further from home. I did enjoy The Selected Works of T.S. Spivet once I got over feeling that the footnotes were interrupting the story. Note: several weeks after reading this novel, I watched The Young and Prodigious T.S. Spivet which was a very enjoyable movie. The story had been abbreviated and simplified and was suitable for children to watch also.